The meaning of the term ‘tarka’ is not clear in the modern literature on Classical Indian Philosophy. 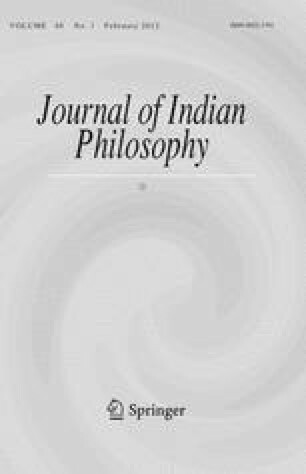 This paper will review different modern readings of this term and try to show that what the Nyāyasūtra and its classical commentaries called a ‘tarka’ should be understood as the following: a tarka is a cognitive act that validates a content (of a doubt or a cognition or a speech-act) by demonstrating its logical fitness or invalidates a content by demonstrating its logical unfitness. A tarka can act as a metatheory too. Generating certainty is, according to the Classical Nyāya, a job assigned to an epistemic instrument (pramāṇa). It fails to do so when there arises a doubt regarding it. The moment a tarka dispels the doubt, the epistemic instrument generates certainty. Tarkas of different types will be exemplified by critically analyzing Gaṅgeśa’s applications of tarka in his magnum opus Tattvacintāmaṇi. These examples will clarify the definition of tarka formulated in this paper.